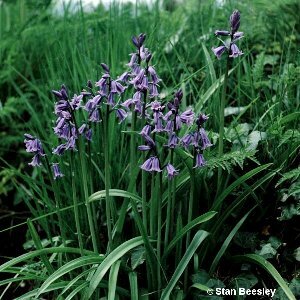 A garden species, native to the Iberian Peninsula, and generally similar to our native wild bluebell (Hyacinthoides non-scripta) but with broader leaves, and with the flowers broader and not hanging to one side. It has been widely planted in gardens and demesnes where it becomes wholly naturalised. Also found as garden throw-outs on rubbish dumps. Spanish bluebells and native bluebells will introgress when grown together. Several parks and demesnes have such hybrid populations which show a wide range of forms intermediate between the two parent species. All names: Hyacinthoides hispanica (Miller) Rothm. ; Endymion hispanica (Miller) Chouard; Endymion hispanicus (Mill.) Chouard; Scilla hispanica Mill.